It was in 2007 that Sebastien Chabal, fierce and legendary player of French rugby, dreaded all the way to New Zealand, embarks on the adventure to create Ruckfield brand in 2009. Surrounded by people as passionate about rugby as him, he is forming a united team with him and sharing the values of their favourite sport: team spirit, respect, friendliness or solidarity to name a few. Wooden tee to keep your rugby ball size 5. Black polo with Sébastien Chabal's name and fetish number 8 on the back, for a sportswear or casual look. This short-sleeved black polo, straight cut, has "jungle" prints reminiscent of New Zealand fern. Black long sleeves polo shirt, simple and warm for winter. 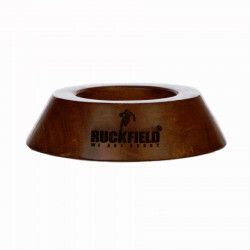 It is an essential piece of the rugby brand, Ruckfield. Navy blue softshell jacket with embroidery on the chest, it will keep you warm and away from the rain! Perfect for winter, this sleeveless jacket allows you to warm up while keeping a Frenchy side thanks to the embroidered rooster. 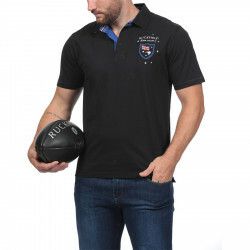 This short sleeves shirt will bring the sporty elegance of rugby to your spring and summer outfits thanks to the Sebastien Chabal's embroidered logo to the chest. This pretty polo is sleek but puts the spotlight on New Zealand and is showing the number 8, the lucky number of Sebastien Chabal. The red jersey polo is the touch of colour that gives your outfit a summer tone. Warm and thick, this polo whose spirit rugby is found on the elbow and the lapel of the collar thanks to the various embroideries. Contrasted navy collar. 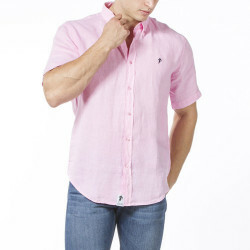 Polo shirt with a straight cut, 100% jersey cotton. Blue, indigo and turquoise colours are used for different style effects. Original lapel. 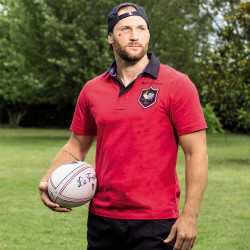 What better than this polo to remind us of the mythical match between France and New Zealand in 1977! Simple with some fancy details.